It does have that although you can’t tell from the picture. Agree. Should the box be a different color then? Is there some type of mesh thT would be attractive & could be mounted? How about a sticky clay-like, gummy material? I’d check Michaels or AC Moore. 3M probably would make such a product. Good luck; it looks very nice! I love this. I have a ton. If I don’t make mine , I should just send them to you! Good idea. It’s good to empower your staff to think on their own. 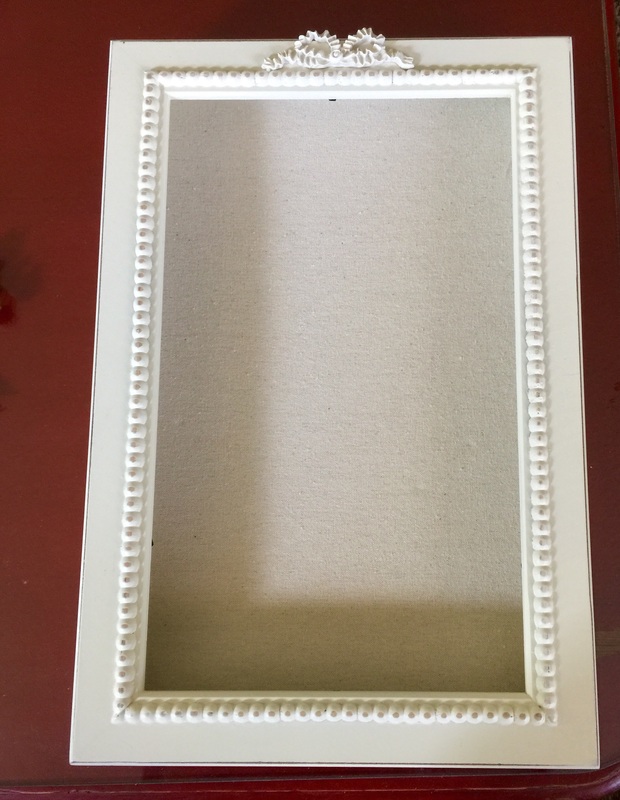 We think no to hot glue gun Mom has a shadow box but here are her problems. She pinned the pins to batting covered in a nice print. But the pins are heavy and pull down on the batting so she cannot hang it. It lays flat on a surface which takes up too much room. She has it on the floor under a dresser and pulls it out when she wants to look at them. We don’t recommend this form of display. It looks great. You can put a piece of foam core in the box and pin the pins to it. We think the foam core would work much better than batting….we will tell mom to change hers….thanks Corkscot! We would cover some foam and stick the pins on that. You could then move them around if need be. B u t we are not all that crafty. Woot!!!!!! This is one thing I have considered doing with my pins! I love it! Hot glue a solid colored material to back (burlap is popular right now) or something that would work with the color scheme in the area of the house you plan on displaying your pins and pin them to the material. If all else fails take it to Hobby Lobby and have them to do it. Love the idea never would have thought of it so thanks for sharing. 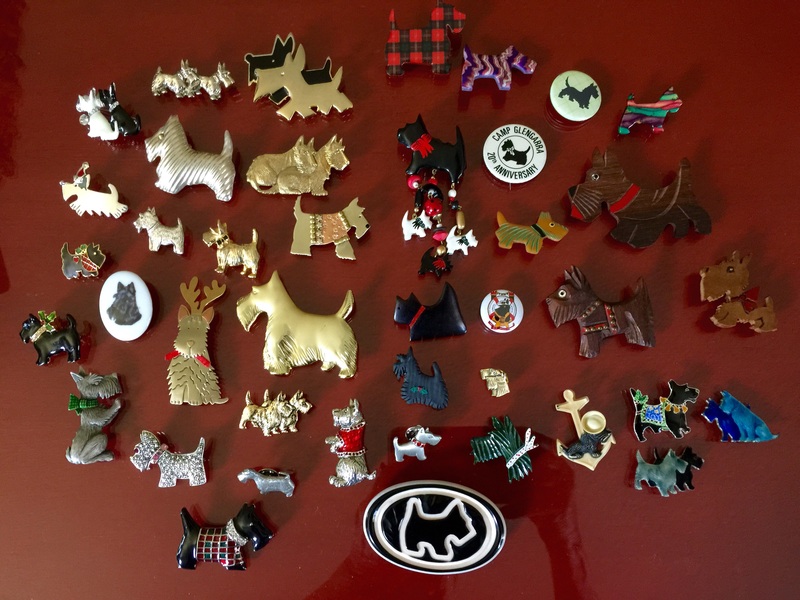 Beautiful collection of Scottie pins!! I love the Shadow box too. By any chance are all of the pins a metal that would stick to a magnet board? Or you could get magnetic tape with sticky back, and then put them on a metal backing covered with a thin decorative material of your choice. so they stick with the magnetic tape, if they’re not too heavy. Or get those 3m clear hooks that you can paste on all kinds of surfaces, but release with a snap and don’t ruin the surface, and hook the back part of the closed pin onto the hook if that’s possible. 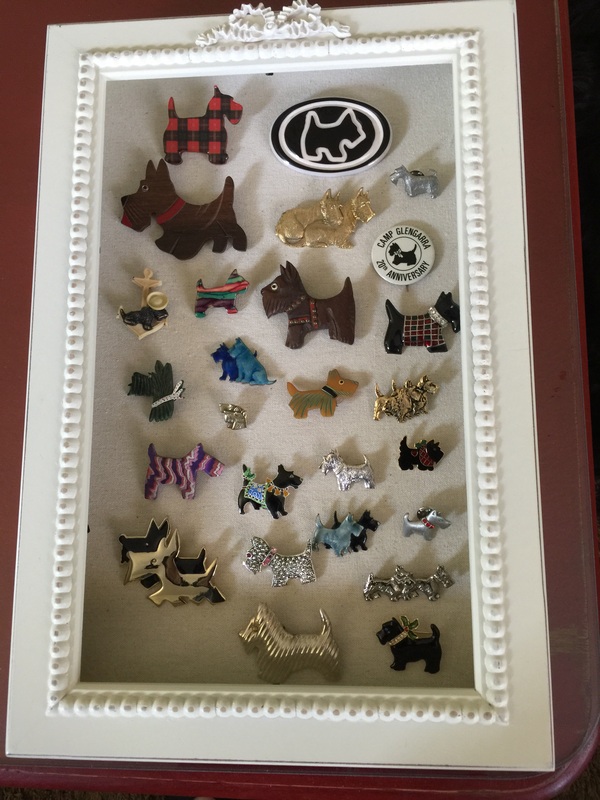 If it will be a permanent hook in the shadow box then you can glue the hook on whatever backing you choose and hang the pin on by the back closed pin. If the pins are the tack-on kind then maybe the magnetic tape would be better to tack the pin on and the little toggle fastener dealy would be pressed in on the back of the somewhat thick magnetic tape. These methods are just in my mind. I don’t know if it would bulge out or droop or if they’d stay straight. The simpler way would be just to pin them on a velour or velvet covered piece of cardboard like they pin them on when you buy them boxed.